We have, officially, dropped the dummy. Yay! We didn't do it consciously... it just kinda happened. I never really intended to give Lara a dummy at all. I bought some before the birth just because I felt it was the right thing to do; just another one of those things on the checklist that the world told me I needed. As a breastfeeding mum, I was very careful not to offer Lara a dummy during the first 4 weeks to make sure that she was well-established at the breast. As it was, we didn't need to use one during that time. Lara took to breastfeeding easily and so, when the moment came, I didn't feel worried about introducing a dummy. I can clearly remember the first time I gave Lara a dummy. She was about 6 weeks old. It was about 3am, Lara had been awake for over 2 hours and screaming for most of that time. I had fed her, changed her, sung to her, rocked her in the bouncy chair and played a little Baby Mozart. All of the usual tricks had failed to calm her and so, feeling desperate, I fished out the tiny little dummies from the cupboard and hey presto – peace at last. I felt guilty for about 5 minutes but then I fell asleep and accepted the fact that the soother really had done what it said on the tin... soothed her. Over the next 12 months, we used a dummy/soother to settle Lara to sleep or to chill her out a little when she was particularly ratty. The dummy came with us wherever she went and I supplied one each day for the childminders but it never became part of the furniture. For us, the dummy was used to calm Lara down when she really needed it. This weekend we went swimming at Coral Reef in Bracknell. In amidst the whirling rapids and showering water cannon there was a baby in a rubber ring who was probably about 6 or 7 months old; her mum was struggling to keep a dummy in. The child was smiling and giggling having the time of her life and I just didn't understand why she needed a dummy at all. Anyway, Mr. B. and I decided that at 12 months we were going to attempt to remove the dummy. We didn't do it straight away because we were also moving Lara over from formula to cow's milk AND introducing a fixed bed time so we thought that we would get those two things out of the way before attempting the dummy cold-turkey. Both the cow's milk change and the bedtime change went well and then about 2 weeks ago I was at my parents and my Mum asked about the dummy (she was going to be babysitting for a night so was asking whether she would need it); it suddenly dawned on me that we hadn't used one for days! We had dropped the dummy by accident! We have now been dummy-free (apart from about 5 minutes this Saturday morning at 4.30am after Lara has been awake and whingeing for over 3 hours) for about 4 weeks. Now that we look back, Mr. B. and I realise that while we were introducing the new bedtime routine we were both resisting the dummy as part of that routine. And, when Lara stirred during the night, our first reaction wasn't to go and pop the dummy back in but to turn her over, comfort her and leave her to it. Having dropped the dummy, I feel like Lara is now in control of her own moods. If she is stroppy, she lets me know rather than sucking away the stress. If she is tired, we have to find a way to settle her down (and she has to find a way of chilling out too). I feel like I have passed onto her some of the responsibility for her own peace and quiet. 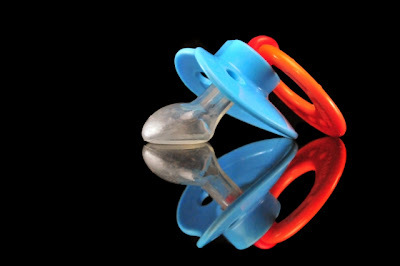 I don't regret using a dummy but I'm glad it has gone now.